Help the Literatures in English Section sponsor an LES member’s attendance at the ACRL 2015 Conference in Portland, Oregon this spring! We are participating in the ACRL member-supported Kick Start the Future Campaign in honor of ACRL’s 75th Anniversary. We seek to raise $635 to provide a scholarship to an early-career librarian to help cover the cost of conference registration and housing. We’re over two-thirds shy of our goal. If you have attended an ACRL conference, you know how valuable an experience it can be. Let’s give that experience to one of our colleagues. If we do not meet our goal, donations will go to the general ACRL scholarship fund, and the Section will be recognized for its contribution. Likewise, if we exceed our goal, the excess goes into the general ACRL scholarship fund. More details about the campaign and scholarships can be found here. Begin by selecting ALA Divisions and Offices, and then ACRL Friends Fund-Professional Development. At the options on the checkout page, click on Add Tribute. It is important to enter LITERATURES IN ENGLISH SECTION as the Tribute Name. 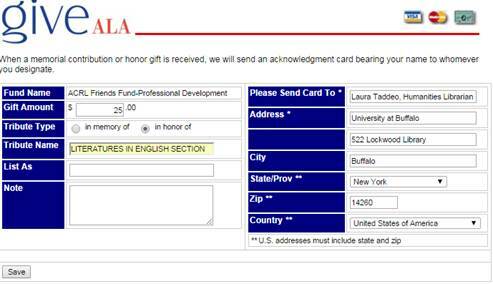 If you would like LES to be notified of your gift, you can have a card sent to LES Chair Laura Taddeo, Humanities Librarian, University at Buffalo, 522 Lockwood Library, Buffalo, NY 14260. Please see this page for step-by-step instructions to donate online, by check, or by pledging. On behalf of the ACRL Literatures in English Section Executive Committee, thank you! We hope to see many of you at ACRL this spring! Are you attending ALA Midwinter in Philadelphia? If so, please join your fellow LES members on Saturday, January 25 from 6-8 PM at Maggiano’s in Center City. LES will provide appetizers. Drinks and additional food can be purchased. This is also a great opportunity for those interested in the LES section to meet some of our members. Library students, recent graduates, and literature and humanities librarians are welcome to attend! LES is also hosting virtual discussion group meetings for Midwinter that are open to all. You can learn more about these meetings, and other relevant meetings that will be held at Midwinter at http://www.acrl.ala.org/lesblog/?p=364. Will your library be the next winner of the ACRL Excellence in Academic Libraries Award? If you think the answer could be “Yes,” please read on! The ACRL Excellence in Academic Libraries Award, sponsored by YBP Library Services, recognizes one outstanding community college, college, and university library each year for the accomplishments of librarians and other library staff as they come together as members of a team to support the mission of their institution. In recent years, award-winning institutions like Indiana University (2010), Carleton College (2008), and Hostos Community College (CUNY) (2007) have been recognized for the way in which librarians and library staff have come together to engage their students, faculty, and community users to design and deliver innovative services, spaces, and collections that represent the best of what a 21st-century library can be. It’s your turn! Nominations are currently being accepted for the ACRL Excellence in Academic Libraries Award, and are due on December 3, 2010. If you think you work in an outstanding library that deserves recognition, please review the guidelines for preparing a nomination at http://www.ala.org/ala/mgrps/divs/acrl/awards/excellenceacademic.cfm. If you have colleagues at a library that deserves recognition, please share this message with them. ACRL members are an integral part of the award process, and we depend on you to help to ensure that the best of our colleagues are recognized for their work. Complete information about ACRL’s Awards Program is on the ACRL Web site (click on “Awards”). An article in the September 2010 issue of C&RL News outlines all ACRL awards programs. Finally, you can hear from previous Award winners about what winning this award meant to their libraries in a series of podcasts being delivered all this year through ACRL Insider (look for the “Awards” tag). If you have any questions about the ACRL Excellence in Academic Libraries Award or the nominations process, please contact Scott Walter, Chair of the ACRL Excellence in Academic Libraries Award Nominations Committee. Congratulations to Sarah Wenzel, new MLA Liaison! Do You Know the Academic/Research Librarian of the Year?